This month launches an exciting new product from Avon as they partner with Neostrata. The ANEW Clinical Pro Line Corrector Treatment with A-F33 is a mouthful to say but if it makes my frown lines (I mean concentration lines) on my forehead disappear then they can call it whatever they want! Avon says "ANEW Clinical Pro Line Corrector Treatment leverages the power of A-F33 (Amino-Fill 33), an innovative molecule that has been found in testing on skin cells to work in a way that other well known anti-ageing ingredients such as glycolic acid, retinol, and CoQ10 don’t. The molecule works to deactivate critical collagen blocking in skin cells, and helps to unleash untapped collagen. A-F33 is formulated to help stimulate skin cells to produce skin matrix components. 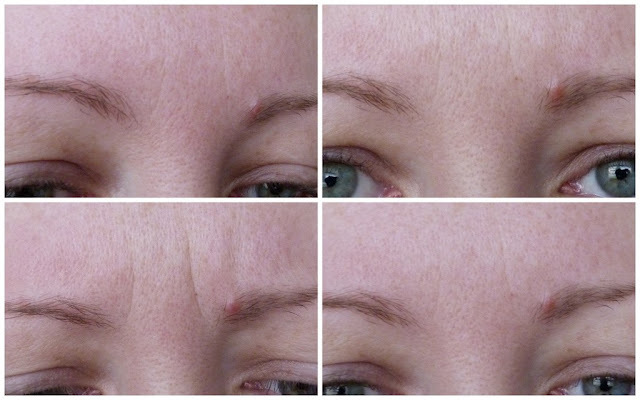 The clinical trial that was carried out gave some pretty spectacular results like "fine lines and deep wrinkles began to look reduced in just seven days. 100% of participants showed an improvement in the appearance of fine wrinkles after 11 weeks, while 96% showed an improvement in deep wrinkling". I can quote you all the ingredients and the sciencey facts, but what you want to know is if it works or not. So I decided to conduct my own clinical trial. I'm all about the experiments and did something similar last year with Origins Plantscription Eye Treatment. So over the next 28 days, I'll be using it every day and will be charting my progress every week, before coming back to you in a month with my results. Of course there'll be photographic evidence with before and after shots and I also have one of my pals from work who's going to do it with me and is also very concerned about her frown lines! So here are the before photos. I know the lines don't look too bad in the photos but when I have foundation on, it likes to make itself at home in those little lines, making them look massive! I'll report back in 4 weeks so stay tuned! It's great!!! Karen and Joanne i write from italy, i'd like to make a present to my mom,but i want to be sure that there's no allergenic ingredient inside this wonderfull cream for mother's skin. Can you, or someone else, help me, by writing the INCI (ingresients reported on the back)of this treatment??? In italy we have to order it and before doing it i want to be confident i'm spending my money in the right way. Hi Karen, how did you get on after the one month treatment? Very curious to know! Hi Julia, I'm still using it at the moment. I stopped using it after a week or so and started back on it, so stay tuned! Notice in the before pic with the glabellar lines (lines between eyebrows) she's frowning and in the 'after' pic she's not.... why dont you just write an honest review..
Ah Unknown, if you'd taken the time to read the actual blog post, you'd see that this isn't a review. Nor are the photos before and after. Just before... And whadaya know, I'm frowning to show my frown lines! I found it really really drying- my skin was peeling off! !